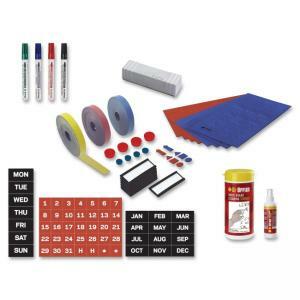 Professional magnetic accessories make building and maintaining your planning board easier. Use different colors to categorize a group. Arrange data easily and quickly when changes become necessary. Set includes four colored markers, dry-eraser, cleaner wipes, spray cleaner, 10 data cards, magnetic tape in red, blue and yellow to divide the board as you wish, magnets (day, month, numbers 1 to 31, two Hs for holidays and two asterisks) and mini magnet arrows, squares and triangles in red and blue.